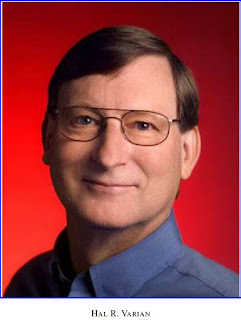 "Hal R. Varian is the Chief Economist at Google, which he joined first as a consultant in 2002. He is also an emeritus Professor in the School of Information, the Haas School of Business, and the Department of Economics at the University of California, Berkeley. Varian’s work has covered a wide range of topics during his 45 years of academic publications. He has made pioneering contributions in the area of industrial organization, including models of price discrimination, consumer search, and an important model of sales. In the area of public economics, he is the author of a very significant paper on optimal conditions for the public contribution to public goods. "Varian has also published a series of influential contributions on nonparametric approaches to consumer demand, including developing a widely-used measure of consumer deviations from the Generalized Axiom of Revealed Preferences. Interestingly, this measure has been employed recently in an area he may not have envisioned, as a measure of deviation from rationality in laboratory experiments. "Hal Varian has also been a household name for generations of both undergraduate and graduate students studying economics, as his two textbooks Intermediate Microeconomics: A Modern Approach and Microeconomic Analysis have been read by many economists at the beginning of their careers, distilling in his trademark voice the range of diverse topics which comprise the basics of economics. One could hardly find a better person to write such textbooks, given his wide range of interests, his omnivorous curiosity, and his clarity in exposition, including, to the delight of the reader, the well-placed witty remark. "Remarkably, Varian has not only established himself as a towering figure in economics, but has also contributed to other scientific disciplines. His book Information Rules: A Strategic Guide to the Network Economy (authored with Carl Shapiro) has become an influential early guide to the information economy. In this vein, Varian has also made a number of contributions to strategic choices at Google, including work on the design of Google’s IPO which was executed as an auction. "His most recent research has focused, among other topics, on how the information embedded in Internet searches contains very valuable information for future outcomes. In his work on nowcasting, Varian (with Hyunyoung Choi) shows that the number of searches online for cars or unemployment benefits allows one to obtain measures, respectively, for car sales and jobless claims weeks ahead of the official data release. This research has spawned substantial interest in the area, including the widespread use of the Google Trends service. "Hal Varian started his career as an economist at the University of California, Berkeley where he earned his PhD in 1973. After teaching at MIT and at the University of Michigan, he returned to UC Berkeley in 1995 as the founding dean of the School of Information. He was a coeditor for the American Economic Review from 1987 to 1990, and is a fellow of the Guggenheim Foundation, the Econometric Society, and the American Academy of Arts and Sciences. He also holds honorary doctorates from the University of Oulu, Finland and the University of Karlsruhe, Germany." Congratulations. Well deserved: Hal's insistence that information theory has much to contribute to economics is a solid and lasting contribution.